For many years various solutions had been proposed to roll back the scourge of time. Solutions included (but were not limited to) a good scrub, bleach, Denture cleaner, fine grit sandpaper and oxy-clean. I personally tried many of these solutions to debunk their effectiveness. While a good scrub can clean away surface dirt or even yellowing caused by smoking, it is only a surface approach, and the Denture cleaner makes the item minty. I found bleach to be ineffective and potentially harmful to the plastic if left on for too long. I was experimenting with action figures, so sanding them was impractical for many reasons, not just the amount of time and effort involved. Oxy-clean appeared to have no greater effect than a good scrub until I came back to the figures months later and found that it had promoted yellowing making them worse than ever before. I also tried coating them in Baking Soda to no change. So far, I felt that I had done a good job disproving the myths about bringing toys back to their original brilliance. One day, someone posted about a Transformers collector in Britain using Hydrogen Peroxide and sunlight to de-yellow their toys. This sounded crazy to me, considering that the sun was the major enemy of this plastic. I attempted to test the theory first by leaving my figures inside in a jar full of H2o2 without direct exposure to light. After a couple days, I could see no difference. So, I followed the procedure of setting the jar outside on a sunny day. After 12 hours the whites were whiter. Stronger potency Peroxide is more effective in both time and brightening. I am not a chemist, so I cannot explain how the plastic breaks down or how the H2O2 breaks down, or why that would leach the bad chemicals out of the plastic. What I can tell you is that the experiment did not end there. Was this a permanent solution to the problem? Literally, only time would tell. So, I took my experimental figures and threw them into a closed box and stashed that in a temperature controlled room for several years. Every once in a while I would revisit them. What I found didn't necessarily shock me, but it did sadden me. The pieces had begun to yellow again. Not to their previous levels, but noticeably yellower than after their initial treatment. This treatment was a stop gap, not a solution. To view my original experiment and the subsequent discussion from 2008 You can look here. I can say from personal experience that the H2O2 mix on a sunny day works really well. I grabbed a bunch of standard 16 oz bottles of peroxide from Walmart for about a $1 each and dumped my older castle sets into a foil turkey pan (or glass pan placed on top of a sheet of aluminum foil) and set out on my back porch one summer day for a couple of hours. Bright light and heat helps (slower process in winter). The classic gray colours all stabilized nicely and none of the printing was affected at all. It's definitely more noticeable on whites to be sure. Best of all, you can just re bottle the peroxide and use it again the next time. You say they treated pieces started to yellow again after a few years, and because of that they wouldn't be a permanent solution. Did you expect such a treatment would stop the pieces from yellowing completely? I wonder how those pieces would look if they wouldn't have been treated at all, after the same total time. To me, this doesn't look so bad at all. Sure, you don't get them completely white again, but the difference looks quite nice to me, and I would always expect having to repeat this every few years to keep pieces whiter for longer. The only permanent solution would be to use another plastic/color material from the start. now, in the case of Lego, why not check to see if the parts are more brittle (prone to cracking when building) since the peroxide treatment. 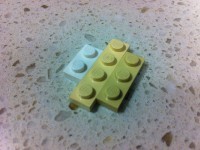 I cannot recall where I stashed my yellowed LEGO pieces. I may have recycled them. I was asking discreetly if anyone had any. Considering that some of my older sets that are not yellowed have brittle pieces, I am not sure if I'd get demonstrable results. Very nice blog, thanks for sharing this technique. yeahbasically the same thing, Hydrogen Peroxide, oxyclean and UV. But in order to keep your stuff from turning back, they recommend spraying them with some kind of sealant. You could probably accomplish it yourself with H2O2 and just revisiting it every once in a while. Thanks Roy. The technique crops up every once in a while, but I don't know that many people have revisited the items several years later to show what happens. Yes it does, but it doesn't work for long term. Your post demonstrates that it does work, but I went back later and showed the results after several years. I also didn't discuss the damage that occurs if the pieces are left in the H2O2 for longer than a day or 2. Many people saw significant damage to colored pieces that were left in for a week. Put pieces in bright sunlight outside at breakfast time, retrieve mid afternoon, soak/rinse them in warm soapy water for 10-15 min, set out on towels to dry overnight. The pieces come out clean, bright and actually seem to have stronger friction when stacked together. I keep my assembled sets out of direct sunlight anyhow, so they may last longer before yellowing reoccurs. The ABS plastics will discolor over time with exposure to air, it's just a chemical reaction you can't stop, but this seems to be a very simple and non damaging process to repeat to reverse the effects. I think the discoloring is what you expect on an older set. It shows the true age of the set and I feel that gives it character. I noticed the snow troopers are not in your 6 year later photo. Who'd you sell them to? I hope you can live with yourself. Great article, and thank you for posting it. LOL, yeah, 6 years later, I lost patience trying to remember where I put everything. At this point I think the whole lot got shipped off to goodwill by my wife. On a side note, awesome back yard!! Love the yard and the mountains in the back. Are you in Colorado? God I love that state! Oh and by the way, thanks for the video. I always wondered if there was anything that could be done for those poor bricks. The videos were just a couple of the examples that I found, I take no credit for them. All plastics degrade or "age" over time. The chemical formula of ABS plastic makes it susceptible to chemical oxidation with air. All ABS plastics will undergo this reaction unless coated with some kind of protectant to provide a barrier between the plastic and air. This is true of all ABS plastics, not just Legos. Technically, ABS plastic is what we call a "glass" or "amorphous solid" in chemistry. Thus, like all glasses, ABS plastic will also undergo physical aging, which makes the plastic stiffer and more brittle. This physical ageing can be reversed by heating it up to the glass transition temperature, which is in the range of 85 to 125 C, depending on the exact composition. Thus the softer and less "viscous" nature of the plastic can be restored, though the physical ageing process begins all over when the plastic is cooled to normal temperature. In contrast, the chemical ageing cannot be reversed in ABS plastic. I have not studied this in detail, but I strongly suspect that the hydrogen peroxide is reacting with the surface layer of oxidized plastic making it soluble in the hydrogen peroxide solution. Thus, what you are doing is really removing the outer layer of the plastic revealing a fresh surface that has not been oxidized. As the OP experienced, the oxidation process continues on the new surface. All uncoated ABS plastics will undergo this reaction, it's just more visible with lighter colors. This phenomena is also seen in old Macintosh computer cases, and unpainted toy train cars made of white ABS plastic, or clear toy windshields or lenses for lights. I've got translucent clear Lego pieces from the 70's that are now a light amber color. In toy trains, if the windshield or windows of an old engine are not an amber color, you know they have been replaced with a reproduction part. I believe the effect of the sunlight is only to speed up the reaction by splitting the hydrogen peroxide molecule causing a faster reaction with the surface of the plastic. The same increase in reaction rate can be accomplished with a more concentrated hydrogen peroxide solution. Also, hydrogen peroxide slowly decomposes over time to make water and oxygen. Thus, you can't store it indefinitely, since the concentration decreases with time. Lower temperatures decreases the rate of decomposition, so we store our hydrogen peroxide solutions in a refrigerator in our chemistry labs. Today i tried this using artificial light, and it worked a treat. We rarely get the sun in the UK during the winter months, so i thought i'd try it under the T5's of my Reef Aquarium. After leaving them for 5 hours i was amazed to see 90% of the pieces restored. I've left the other 10% under the lights as they need more time. What solution are you using? This reminds me that I have a 10019 I bought years ago that needs this badly. That's what I get for trusting a seller and not opening the package for a year. I used a 6% solution and diluted it with RODI water to get a 3% solution. Working very well indeed, however it's a PITA to do the sides, i will have to mount them on a 90deg bracket to keep them in place.